The 99.2MW Bac Lieu Province wind power project is Asia’s first offshore wind farm. Image: courtesy of Descon. The first phase of the wind farm includes 10 GE 1.6MW wind turbines and has been operational since May 2013. Image: courtsey of HTL. The Bac Lieu wind power project also included the construction of 22/110kV-63 MVA transformer stations and approximately 30km of 110kV transmission lines. Image: courtsey of HTL. The Bac Lieu wind power project was financed by the United States Export-Import Bank and the Vietnam Development Bank. Image: courtesy of The Vietnam Development Bank. Developed on a 540ha site in the East Dam region of Bac Lieu province, Vietnam, the 99.2MW Bac Lieu near-shore wind farm is Asia’s first offshore wind farm in the Mekong Delta region. The phased development of the Bac Lieu wind farm included the installation of 62 1.6MW wind turbines, supplied by General Electric (GE). Construction commenced in September 2010 and the first phase was grid-connected in May 2013. The wind farm became fully operational in January 2016. Cong Ly Construction-Trade-Tourism invested VND5.2tn (approximately $244.4m) in the project. The wind farm is expected to have an operational life of 22 years. The 320MW Ban Ve hydroelectric power plant was commissioned in May 2010. 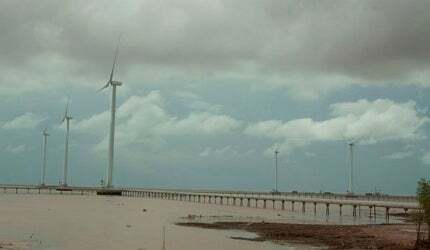 The wind farm is located in a submerged coastal area of Vinh Trach Dong Commune in Bac Lieu city. It has a gross annual electricity output of 335.2GW/h and offsets 151,331t of CO2 emissions a year. The GE 1.6-82.5 wind turbine has a rotor diameter of 82.5m and a swept area of 5,346m². Each turbine, made of special stainless-steel, weighs more than 210t and sits on a tubular steel tower with a height between 80m and 100m. The rated speed of the turbines is 1,915rpm. Using a doubly-fed asynchronous generator with a partial power converter system, the turbines are equipped with an electric-drive pitch control system with battery back-up for efficient speed regulation. "The first phase of the two-stage power plant extended over 80ha and comprised ten wind turbines with a total capacity of 16MW." The first phase of the two-stage power plant extended over 80ha and comprised ten wind turbines with a total capacity of 16MW. The turbines delivered 58 million kilowatts an hour to the national grid during the first 14 months of operation. The second phase included the installation of the remaining 52 turbines with a total capacity of 83.2MW and a net output of 272,471MWh. The first 20 turbines in phase two were grid-connected in May 2015, increasing the plant’s generation capacity to 48MW. A total of 16 turbines were installed in September 2015 to increase the plant’s capacity to 73.6MW. The remaining turbines were installed in April 2016. The electricity generated at the Bac Lieu wind farm is supplied to the Electricity Corporation of Vietnam (EVN) under a power purchase agreement (PPA). The wind energy is transferred to the national grid through a connection point. Digital and bi-directional type electricity meter systems are installed at the connection point to measure the export and import of electricity from the wind farm. New 22 110kV-63 MVA transformer stations and approximately 30km of 110kV transmission lines were built to transmit the power to the national grid. "The Bac Lieu wind farm is the first project developed under the US-Vietnam private sector agreement." The Bac Lieu wind farm is the first project developed under the US-Vietnam private sector agreement, which is part of the US-Asia Pacific comprehensive energy partnership aimed at addressing energy access and energy poverty issues in Asia-Pacific regions. The Export-Import Bank of the United States (US Ex-Im Bank) and the Vietnam Development Bank (VDB) jointly funded the wind farm. VDB was responsible for the investment credit and foreign loan, while the US Ex-Im Bank provided a $1.5b credit line to finance the project. GE was awarded the contract for the supply of wind turbines for Vietnam’s Bac Lieu wind farm. The contract for the construction, transportation, and installation of wind turbines for the first phase of the project was awarded to Huy Hoang Transportation & Logistics Corporation (HTL). HTL was also awarded a contract for the construction of 20 wind turbine foundations for the second phase. Descon was awarded a contract for the construction of the foundation for eight wind turbines (No. 55 to No. 62).